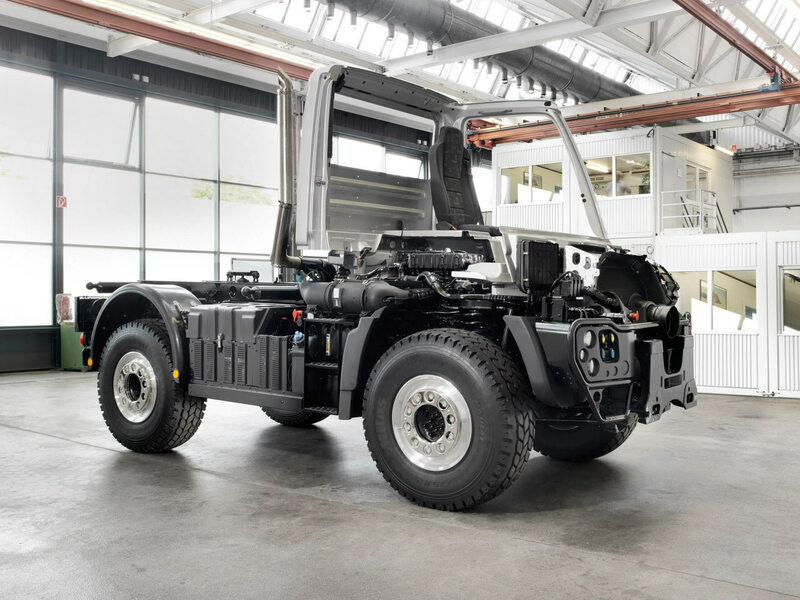 Mercedes-Benz at the IAA 2012 is giving a first glimpse into the future of the Unimog as a technology carrier by presenting the future drivetrain which combines compliance with the Euro VI emissions standard with a compact chassis. It is based on the medium-sized U 400 model. 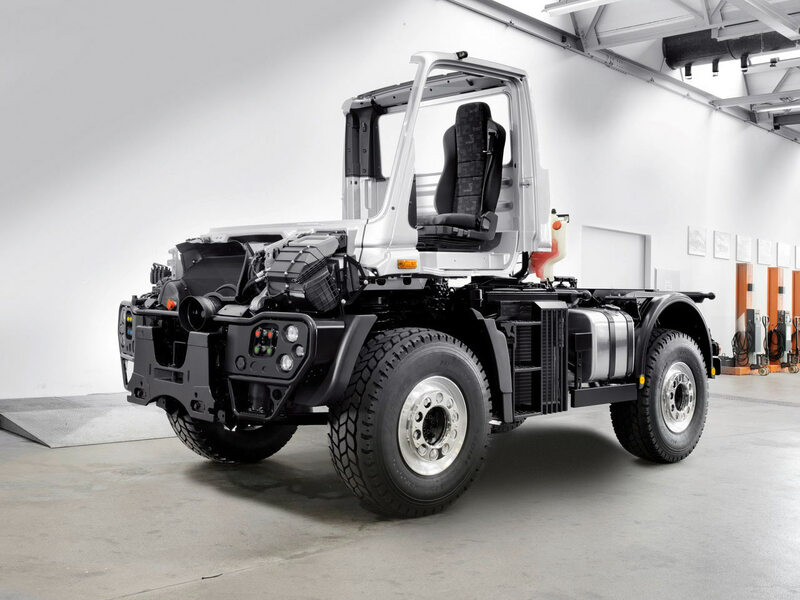 In taking the step towards Euro VI, the Unimog will make use of the new generation of Mercedes-Benz OM 934/936 engines with either 5.1 or 7.7 l displacement and four or six cylinders. They are grouped under the term BlueEfficiency Power. The new engines impress with their multitude of technical refinements. A crossflow cylinder head with four valves per cylinder ensures a rapid gas cycle. Two overhead camshafts per cylinder take care of valve actuation; the camshafts are based on a single-tube design to which the cams are shrunk on. This method of construction is light but at the same time strong. Among the refinements of the new OM 936 is the variable camshaft phaser (VCP). This term describes an adjustable exhaust camshaft, the first such camshaft ever to be fitted on a diesel engine. The adjustment serves to assist regeneration of the particulate filter. If regeneration is necessary, the actuation times for raising the temperature level in the exhaust train are adjusted. Exhaust gas aftertreatment in both engines employs Mercedes-Benz BlueTec-6 technology: a closed particulate filter is perfectly complemented by the SCR system which Mercedes-Benz has been using successfully for several years now. The BlueTec-6 technology causes particulate emissions to be reduced to such a level that they are hardly recognisable and the use of AdBlue injection in the downstream SCR catalytic converts nitrous oxide emissions to harmless substances found in the air. 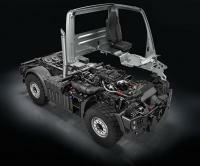 The performance of the Unimog will also be improved with the new engines. 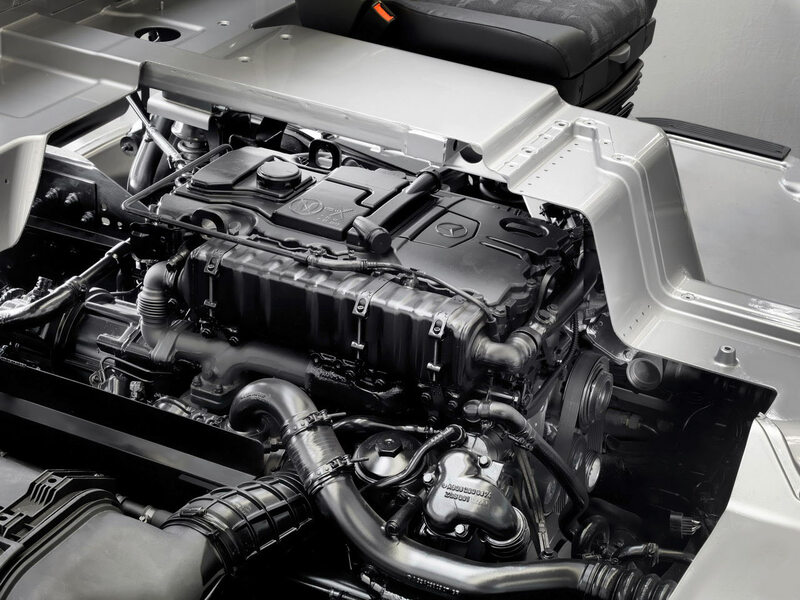 For the first time, the six-cylinder engines of the Unimog will achieve the 300 hp mark (220 kW, 299 hp). The drivetrain for the all-wheel drive implement carrier is provided by the well-known Unimog transmission. Just like the portal axles, it too has been reinforced for the increased engine torque of up to 1200 Nm. The designers have also implemented a new components package which compensates for the larger volume of the Euro VI equipment, which results from the large cooling system and additional particulate filter. This package involves the cooling system being divided into several components installed on two different parts of the chassis. Engines designed for the Euro VI emissions standard require a larger supply of cooled air and this is provided in part by improved airflow around the engine. The new cooling concept will also make a name for itself thanks to its very easy maintenance.